LGMD RESEARCHER: Charles P. Emerson, Jr., Ph.D.
What education and training did you have to arrive at your current position? My undergraduate degree major was in biology/biochemistry and included three summers of research on muscle protein biochemistry, a transformative experience that opened my eyes to the excitement of research discovery and lead me to pursue a career in biomedical research, work that still excites me. My graduate degree and research training was in emerging fields of molecular and cell biology, focused on application of molecular biology approaches to developmental gene regulatory mechanisms, using the developing sea urchin embryo as a model system. My postdoctoral training brought together my undergraduate interest in muscle biology and my graduate interest in developmental gene regulation to initiate a career long research journey of investigations of basic mechanisms of muscle development and differentiation, using a diversity of biological systems, including muscle cell culture and Drosophila, avian and mouse genetic and embryological animal models, and experimental approaches including cell signaling, gene cloning and DNA sequencing, transcriptional regulation, and cell reprogramming. About 10 years ago, I was inspired to redirect my research entirely to human muscle development and muscular dystrophy. What led you to follow a career in research and in studying muscular dystrophy in particular? Prior to 10 years ago, my research was focused exclusively on understanding gene regulatory mechanisms that program the genomes of embryonic cells to commit to become muscle stem cells express muscle genes during their differentiation. My studies were supported generously by the NIH and by the Muscular Dystrophy Association with the foresight that this basic science knowledge would ultimately lead to understanding human disease and therapeutics. My decision to refocus my research program towards human muscle biology and disease was in part inspiration and in part a recognition that the time had come use my basic science expertise make a contribution. First the inspiration. This comes from my personal association with people and families with physical disabilities. Up close and personal, my daughter is profoundly physically disabled as a result of brain injury at birth. I am grateful for her grit and determination to make a meaningful life, greatly facilitated by the recent inventions of the motorized wheelchair and computers. My daughter has been a constant reminder that my expertise in muscle biology might someday be able help kids and adults with muscle disabilities and to appreciate that seemingly small improvements in muscle function can have the huge impact on the quality of life of the physically disabled. Then, one afternoon 10 years ago, a guy with muscular dystrophy, Daniel Perez, rolled into my lab in his wheelchair and asked me why I, a pretty good muscle biologist, was not working on his muscle disease. I had never heard of his disease, FSHD, shocking me to a reality that, despite my “muscle expertise,” I knew almost nothing about any of the muscular dystrophies. Daniel opened the door wide for me to the world of muscular dystrophy research. He was is extremely informed about FSHD and muscular dystrophy research, he was building and educating a network of leading muscle researchers to investigate dystrophies and define specific research priorities, and he was a highly vocal and effective advocate to Congress for NIH funding and organizer of FSHD patients and family members to participate in research. I also realized that the time was right to translate my muscle basic science to human muscle disease models through my expertise in muscle stem cell biology and gene regulation, expertise that has enabled me develop human cell models of FSHD and now LGMDs muscular dystrophies, enabling a new level of understanding of the molecular pathology of specific dystrophies as well as providing experimental platforms for development of therapeutics using patient-derived muscle, far beyond animal disease models. Over the past 10 years, my research has been entirely re-focused on human muscle biology and muscular dystrophies, initially FSHD and more recently on LGMDs including LGMD2i and 2G. Like FSHD, my research on LGMDs also was inspired by patients and advocates with passionate and informed voices and with hopes for therapies for their diseases in their life times. What topics are you studying? Today, my research lab, together with a cadre of talented and collaborative academic and industry partners, clinicians, and patients, is pursuing pre-clinical development and validation of drug, stem cell and gene correction therapies for the treatment of FSHD, LGMD2i and LGMD2G. How will your work help patients? Is it more scientific in nature or might it become a treatment for LGMDs or MDs in general? My research to develop muscular dystrophy therapies has been made possible because patients and family members have eagerly donated their cells and muscle tissue to researchers such as myself making it possible to develop drugs, stem cells and gene correction tools and disease biomarkers to understand human disease pathology and support future clinical trials, not possible using animal models of human disease. Our goal is develop therapeutics for patients with FSHD, LGMD2i, and LGMD2G, to be evaluated in clinical trials and clinical use. 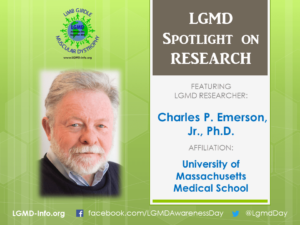 What would you like patients and others interested in LGMD to know about research (your own projects and about the field in general)? Muscular dystrophy research is rapidly advancing towards the development of therapies for clinical testing, so patients and families should be hopeful, passionate and informed advocates and partners with scientists to test therapeutics in clinical trials, which are just beginning to emerge. Each of the 44 genetic muscular dystrophies has it’s unique therapeutic challenges. However, the pace of discovery is accelerating, spurred by the development of innovative therapeutic modes unheard of 10 years ago, including gene therapy, stem cell therapy, CRISPR gene correction therapy, RNA therapy, and advanced small molecule drugs, dramatically increasing therapeutic options for treatment of all muscular dystrophies. However, significant challenges remain including delivery of therapeutics to muscle, which is functionally complex and distributed throughout of the body, and development of clinical trial protocols to accurately and quickly measure the clinical outcomes for improved muscle function, requiring a patient-researcher partnership There is still a lot to learn about treatment of muscle disease, but researchers and patients working on different dystrophies are actively learning from one another’s work and experience, accelerating the pace of discovery and the pace of drug development. Patient passion and participation in ongoing research and clinical trials are essential for progress. What inspires you to continue working in this field? My hope and inspiration is the emerging promise of therapies for LGMD muscular dystrophies over the next five years. How can patients encourage you and help your work? Patients are essential partners in therapy development through their participation in research and clinical trials, their engagement and inspiration to researchers and clinicians and scientist in training to engage in muscular dystrophy research, and their advocacy to the public, NIH and foundations for research funding, which is key to progress.